The St. Paul Police Gang Unit is dedicated to eliminating gang related violence. Our strategies to combat gang violence include prevention, intervention and apprehension. We are committed to working with our community partners to create opportunities for young people. Our officers serve as educators, mentors and coaches in our efforts to make our neighborhoods safer and improve the quality of life for our entire community. The Gang/Gun Unit is under the command of Commander Sheila Lambie (Email). Prevention: Prevent young men and women of Saint Paul from entering into a violent street gang lifestyle. Intervention: Locate confirmed gang members and provide them with alternatives to the gang lifestyle. Apprehension: Locate and apprehend confirmed gang members who have committed crime or are in the act of committing a crime. Prosecution: Charge suspects for illegally possessing firearms and or committing gang related acts of violence. 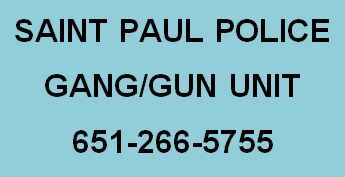 The Gun Unit takes a proactive approach to reducing gun violence in the City of Saint Paul. Officers work closely with the Ramsey County Attorney's Office, the City Attorney's Office and along with State and Federal Attorneys to aggressively prosecute violent gun crimes. Officers work in the community, and in the schools, to educate as well as prevent young people from participating in gang activity and gun crimes. The Saint Police Department participates in State and Federal programs involving firearms, such as the Alcohol Tobacco and Firearms (ATF) Tracing Center, Project Safe Neighborhoods, and the Minnesota Bureau of Criminal Apprehension (BCA) National Integrated Ballistic Information Network (NIBIN). Sending DNA samples from violent offenders involving firearm cases to the (BCA) for testing. Execution of search warrants and the tracking of firearms taken as evidence. Review and the return of firearms to legally-authorized owners.